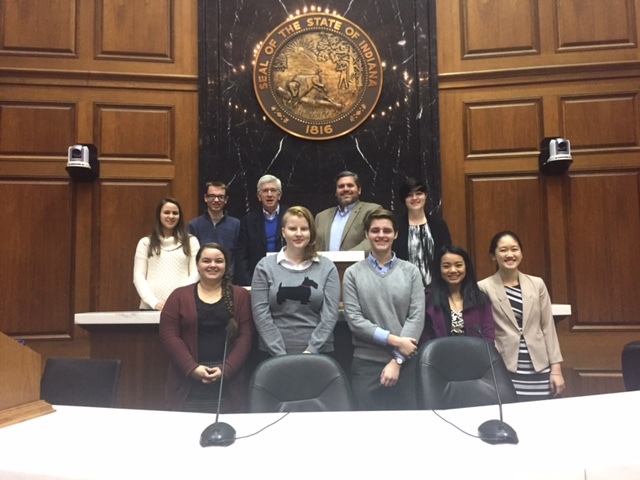 Eight of the high school and college New Voices team members met at the Indiana Statehouse on Wednesday, Dec. 7 to help draft legislation for a New Voice bill and meet stakeholders who would be interested in the legislation. Back: Lydia Gerike, Indiana University; Andrew Tapp, Southport High School; Representative Ed DeLaney, Indinaapolis; Representative Ed Clere, New Albany; Haley Burr, Henryville High School. Click the image or here read the full bill. Click the image or here to learn more about the New Voices of Indiana group.